Infusions can be an interesting way to brighten up a spirit, and one of my favorite ingredients for infusion is tea. The alcohol in most clear spirits will pull almost all of the essential flavors out of the tea without being lost in the process. Now, some teas are great seasonally. But lately I have been wanting to play around with Earl Grey for an infusion, and make it my own. A black tea with a hint of orange zest, Earl Grey is often paired with spirits that can overpower its distinctive flavor leaving little less than a hint on the tip of the tongue when infused. 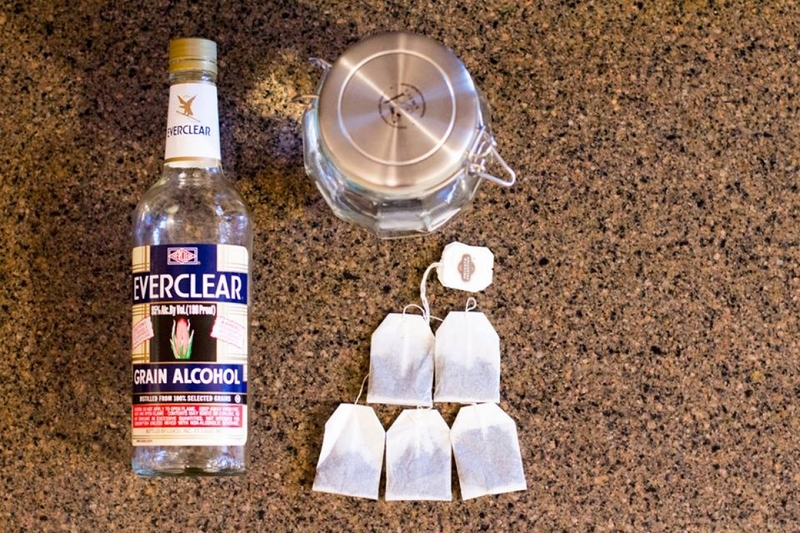 But to pair it with a clear, flavorless spirit such as Everclear opens up a huge range of opportunity to not only experience the full tea flavor, but actually enhance the aroma. With a strong spirit like Everclear, I wanted to ensure I maximized its qualities to bring out as much tea flavor as possible, so decided on one tea bag of Earl Grey per 10mL. The infusion portion is always the easiest after the proportions are set, and inside a airtight container like the one seen in the picture above, you can let the tea bags and Everclear sit for about 8 hours. Any longer than that and you risk pulling out a bitter quality in the tea that will leave little to be desired in the coming cocktail. 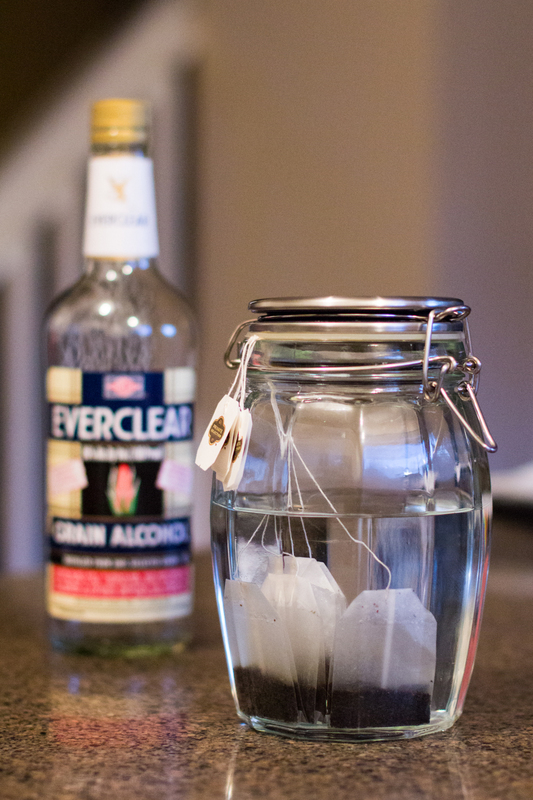 Immediately after combining the tea bags and Everclear the color will being to change, and over the 8 hours, will become a deep yellow with hint of brown. I pulled the tea bags out and let them hang drain over the infusion for a few hours before rebottling back into the original container. You will catch big wafts of Earl Grey as you do this, telling you it’s ready for a delicious cocktail. Now, during the fall and winter, this could probably be heated up for a toddy like cocktail, but as it is the middle of summer, I am craving something cold and refreshing to beat the heat, while letting my play with the notes of the newly infused liquor’s high notes. Pairing it with a citrus and herbal note brings a full summer feel to the drink as well. 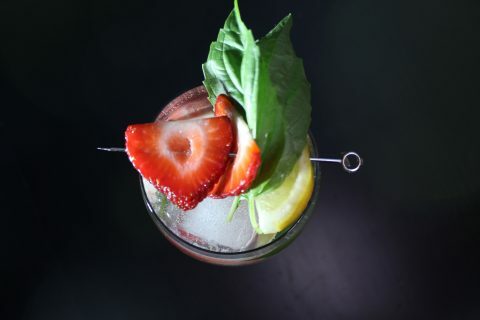 Introducing the Earl Fritz, a fresh, summery cocktail perfect for sipping on the patio during a hot summer day. In a rocks glass, combine the Earl Grey infusion, simple syrup, and dashes of orange bitters over the ice cube and stir to combine. Top off with club soda and garnish with a sprig of rosemary. 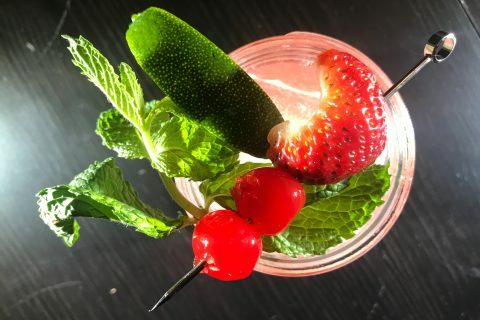 Give this delicious cocktail one last stir, sit back and enjoy. Along with the Earl Grey tea, the orange bitters and rosemary come together in a semi-sweet cocktail. Take a breath of the aromas before each sip, taking in the herbs and orange, the tip of the Earl Grey tea sneaking in, and with the sip, the tea bouncing out in front. It is a harmonious play of layered flavor. This is not my first time playing with Everclear as a base for infusion, and it will not be my last. The qualities and notes the spirit provides open up so many avenues for cocktail building that it truly is a blank slate for the imagination. From tea to roasted fruits, there are so many opportunities to take Everclear on your own and truly make it your own.